In this era of high spec sources, we are looking toward the future of small bookshelf speakers, not only providing good value for price. It utilises an all-new high resolution compatible dome tweeter that makes it completely different from ordinary speakers that claim high resolution compatibility: 40kHz. The focus is on tuning that brings out the reality of vocals, where listeners notice differences in quality the most, and on delivering expansive high and low tones without colouration. With the characteristics and sound quality you would expect from a next generation unit, it features a new structure that places a newly revised aluminium dome inside the voice coil for both weight and strength. 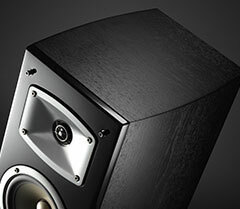 The aluminium’s Black Anodised processing suppresses the aluminium-specific metallic character of its sound, producing a natural, glistening sound quality without colouration. The diffuser features a new shape, and the voice coil is comprised of CCAW (copper-coated aluminium wire) reengineered in material and linearity. While maintaining the amount of information and energy in the audible band it achieves 45 kHz (–10 dB) reproduction with extended high frequencies. This is truly a breakthrough in high frequency reproduction. The unique waveguide horn and tweeter utilise the same waveguide technology used for directivity control in studio monitor speakers to control the incidence of indirect sound. 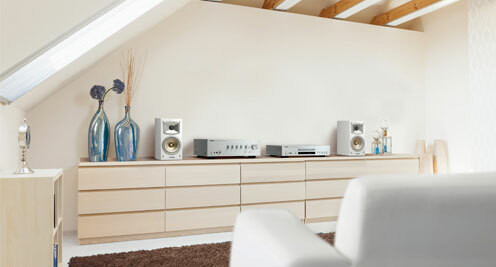 The Vertical and horizontal directivity control increases the sense of sound field, providing vivid stereo reproduction. Incorporating 30% high quality white mica, the 13 cm (5”) woofer utilises a lightweight, high rigidity PMD (Polymer-injected Mica Diaphragm) cone that achieves ideal internal loss and high elasticity characteristics. The new design put both the voice coil and spider under the knife, achieving massive, expansive low tones. As the future of HiFi small bookshelf speakers, its supple and strong bass redefines musical expressiveness. The cabinet features a rounded shape that curves smoothly to both sides. By reducing the number of parallel surfaces it minimises standing waves and unwanted resonance. The front baffle has a double structure with a mirror-like piano finish. With reinforced strength, it produces more natural, extremely transparent high tones.